Charlotte’s tip of the month: Never bring anything into your home unless you have chosen a place to put it. This absolutely does not apply to books. Or dogs. They’ll find the right spot. Let me introduce myself. I am Charlotte Adams, a professional organizer and the lead investigator — amateur, but never mind — in the Charlotte Adams mysteries. I run Organized for Success, in historic Woodbridge, a lovely and thinly disguised town on the Hudson. Woodbridge has fallen on hard times, but things are getting better with the influx of tech types, entrepreneurs and artists. It may not be The City but for my miniature dachshunds, Truffle and Sweet Marie, my wonderful ‘misfit’ friends and me, it’s a great place to live. My organizing business helps people reclaim their homes, their offices and their lives from clutter and disorder. I am proud of my work, even the unofficial sleuthing that seems to grow out of it. Let’s face it. Murder is never tidy. 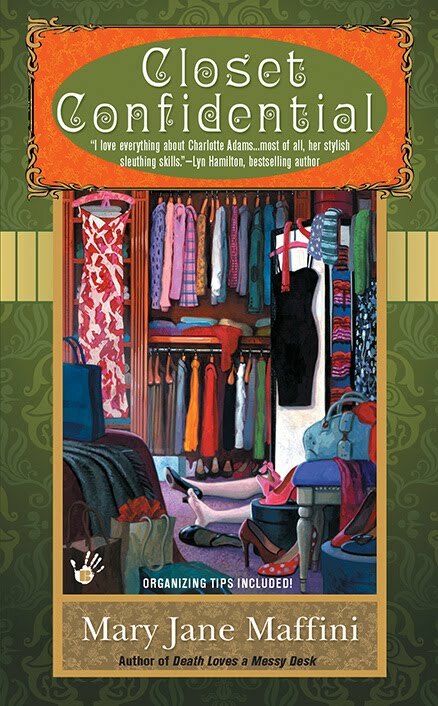 That reminds me: the fourth Charlotte Adams book will hit the stands on July 6th and I’m excited because it’s called Closet Confidential and no one loves a closet more than I do. In Closet Confidential I am able to offer more than twenty excellent tips to readers on how to organize and improve their closets and, ahem, solve a few crimes on the way. What? Oh, darn. My author, Mary Jane Maffini, is whispering that you are free to ignore those tips if you want to and that I should tell you not to be intimidated. Guess who cracks the whip around here? Never mind, being that close to people and their clutter problems has allowed me to learn a lot about human nature. I think it makes me an ideal amateur sleuth. Some people might hint that I’m obsessive or even bossy. I say kind and committed. You be the judge. I am excited about being part of Killer Characters. It’s a huge relief to get out of that chaotic Maffini household and into a great blog where all these amazing characters seem so orderly, showing up for their sessions same date each month and generally talking sense. I haven’t heard a single character yell, “I want that red wine and I want it NOW.” I am very impressed. I think I’m going to feel at home here, probably because the contributors are not writers. I’m just saying. We all know what we go through with our authors. Oh, I could tell you horror stories. Are the rest of you treated as badly as I am? Now that we are together, I hope to organize us into some sort of union or perhaps a professional guild. The Guild of Cozy Characters? The League of Formerly Subjugated Sleuths? I’m working on it and I foresee a manifesto in our future. Seriously. The working conditions are unbelievable in this cozy business. For instance, was it really necessary to have quite so many people ogle that WINY TV clip of me in my frog pajamas and pink fluffy slippers as I was marched off to the cop shop? It’s bad enough I get sent out to vacant lots to confront murderers in the middle of the night, but do my shoes always have to get ruined? That’s so not fair. Those red leather stiletto boots? I will never forgive Mary Jane for what happened to them in Organize Your Corpses, the first Charlotte Adams book. Nothing had better go wrong with this new pair. Then there are the hours! Writers don’t seen to be able to tell weekdays from weekends, but is that any reason why I can never have a day off? Ever? Plus there’s the small matter of my love life or lack of same. First she saddles me with a lying hound of an ex-fiancé; later she ruins the few dates I have with anyone new. Just when I have realized that my heart belongs to Jack Reilly, my friend and landlord, she’s messing with that too. If I’m not careful she’ll have me die single and alone in some foggy graveyard at midnight, having lost my cell phone and failing to inform anyone that I planned to meet the ‘real’ killer there. I need a plan! If you want to know more about the Charlotte Adams books or even my author (sigh), drop by www.maryjanemaffini.com and check us out. You can sign up for the free newsletter with contests, recipes and fun stuff. I make sure that works well. Don’t forget, you can preorder Closet Confidential at www.barnesandnoble.com www.indiebound.org www.chapters.indigo.ca www.amazon.com and www.amazon.ca as well as your favorite indie. Well, I hope MJ lets you keep those shoes nice and clean and perhaps you'll get to wear them on your many more dates with Jack. Charlotte, I'll call you to organize my closets, yes I will, just as soon as I de-clutter them and organize everything perfectly. Which will be...oh, never mind. Thanks, Dru. I appreciate your support with the shoe issue. Elizabeth and Riley, I'd love to visit any of your real and fictional locales and give you a closet consult! Charlotte, it's a pleasure to meet you (particularly coming from another Charlotte - Bessette, that is). You seem to have things clearly in control. I'm sure you'll be able to manage your author in due time. Even authors need to take a breather and not type, type, type. Clearly a glass of red wine might do Mary Jane well. She might let you just drift in her thoughts at that time. Think about it. If you had a bit of cheese with a hint of a sleeping pill...just saying. Anyway, great to meet you and hope you'll stop into Ohio sometime. Does your town have a cheese maker I could visit? I'm always on the lookout for a new cheese. Charlotte, that's just not right about the shoes. Not. Right. And now Jack??? What's fiction coming to? I, ah, could use some help with my closets, too. You know, when you have time between the murders. Have you met Mary Jane's other characters? Surely Fiona would be yelling for wine. Oh, and when is Alvin going to blog? Or maybe that dear Mrs. Parnell? p.s. I've preordered "Closet Confidential". Thank everyone. Avery - Mary Jane and I both love cheese esp, brie. And we love MLK too. We are so there! And the sleeping pill and cheese might be just what I need. Heather, you have such a romantic flair. I knew you'd get it! Shoes and Jack. Not fair. Charlotte, It's a pleasure to meet another chara--ah person who likes an organized closet. It was a real nightmare when I inherited a big old house stuffed to the rafters with stuff. If you ever make it to Scumble River feel free to stop by and I'll show you what I've done with the place so far. Thanks, Skye! I hope your own adventures are unfolding well. I know that Mary Jane is always jealous of your great titles. The Guild of Cozy Characters? The League of Formerly Subjugated Sleuths? My dear, I see you have shoes covered but you must give some thought to hats. Oh, Charlotte-I think in real life you'd make me NUTS (but you look like an EXTREMELY entertaining MC, and would probably get along well with mine, when she finally gets her debut) Your AUTHOR on the other hand, looks like my kind of person--these look GREAT! I need to go look for them! Can't wait until your new adventures! Hey, all you Charlottes! Maybe we should have a union of Charlotte-characters! I sure have the closets for it, and Cheese Charlotte could provide the provisions, and Closet Charlotte could organize us all..
Just a thought...and it would certainly be fun to get together! I love this blog and maybe we could just meet here.. I hate to take the spotlight away from Charlotte Adams but, Hank, will we see Charlotte M. or Franlin make an appearance here? I see some open slots. What will I read tomorrow morning if no character is blogging? Mrs. Peacock? I know I should have a Clue ... Hats. Hmmm. Watery Tart: Good luck with your own opus! In the meantime, there's always that python. Chana - my author is a crazy knitter and her yarn is taking over a closet. I have devised a way for her to keep that stash neat, as she refuses to stop buying. I'll fill you in on a later post. Leann: Walk-in closets make my heart go pitty-patter. Lucky you! I know it's better than you think, you busy girl. Charlotte/Hank: You are right. I think we Charlottes could take over the cozy world. Here's to All Charlotte All The Time! By the way, my author and I just finished Prime Time. WOW!!! Oh...my...goodness....those amazing mini-dachsies....so iresistable, those little charmers!!!! As for the stiletto boots, I am more of a flip-flops/sneakers kind of gal. I'm looking forward to CLOSET CONFIDENTIAL!!!!! the heck with my closets (which are admittedly a mess) - I can't quit focusing on those shoes!!!! Thanks, Ritaestelle and Kaye! You have your priorities right. It IS all about the dogs and the shoes! Ritaestelle, glad you like the tips! Kaye loves doggies too as well as shoes. Thanks, Hollis. I know that your author, Joan Boswell, has a great wardrobe and excellent closets. That's something to think about coming from you! Maybe Jack can keep his own place? I just LOVE Charlotte! 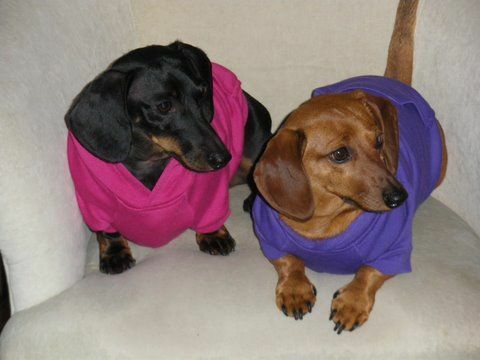 I also adore her tiny miniature dachshunds - such sweet little things. I could definitely do with Charlotte's services right now as my father-in-law is giving us a ton of unwanted furniture and we keep saying yes. If only I'd paid attention to your tip of having a place for everything! (Anyone need night tables? We have five pairs). Pssst, Charlotte. I'd like to hire you to declutter our summer cottage. Do you suppose that pernickety author of yours would ever let you leave Woodbridge? If not, maybe we could do a side deal without telling her. Charlotte, you'd have a heart attack if you saw my closet. Love your dog fashions. I certainly hope your author get's with it and puts you together with the man of your dreams. i do indeed love little doggies - ESPECIALLY those adorable little princess pups. Harley thinks they're his best girls. Charlotte - when you come visit to give my closets the business, I have things to tell you about your friend MJ . . .
Oh, Charlotte! I so love your series and I just wish you sneak away from that MJ long enough to help me clean my closets! There's supposed to be some secret stash in mine...or maybe in the attic. Do you do attics? The closets at Marshfield Manor are pretty well organized (waay before I got there) but at home I'm a mess. Can we talk? Sue! Did you really invite Charlotte without me? Disordered on the Rideau indeed. Betty: I am working on the man problem, but she doesn't make it easy. Good luck with your book! Kaye - are you talking behind my back with Charlotte? Good thing I love that Corgi, Harley. Charlotte: looks like you picked up a chunk of closet business here. Grace! I hope that one of these days, I can visit Marshfield Manor. I am really jealous of your new series. I would love to see what's in that attic! You're not nearly as hard-done-by as poor Alvin Ferguson, who, in his own inimitable style, organizes Camilla MacPhee's life. Come to think of it, you and he might get along very well and you could teach that mean ole MJ a lesson together. What?!!!! Eleanor! Cheryl! Control? Mean? I am speechless. Oh well, off to the bar. You stay here and clean up, Charlotte. Serves you right. As my Scottish Mother would have said, and did often, "Never look a gift horse in the mouth." Remember, Mary Jane is your food ticket! LOL. Daisy and I love your adorable pups! But I'm quite concerned that they've been in touch with Daisy, because she has a habit of removing books from bookshelves and chewing them. They probably told her that advice about everything needing a place except books and dogs. She is your food ticket but as she is also the one to throw you into some of the muckiest grubbiest situations, for a practical tidy well dressed lady like you, I say the sleeping pill sounds like a tasty treat... possibly baked bread with confusing little red currents in it? Thanks, Jeannie! For some reason everyone seems to be against me here. Ah Sophie. I don't know what we can do to keep these pets off the social networking sites. They'll be bad influences for sure.They'll want the vote next. And as for you, Hedgehog, stop stirring up trouble. You're not that anonymous. OK....someone has to add cats to this mixture! So that would be books, dogs, and cats. And Charlotte, no matter how hard done by you are feeling, you've given us many laughs plus very useful tips. So hang in there, girl! Waiting anxiously to get to organizing my closet. Jenn, I can see you in those shoes! Have fun in the closet.